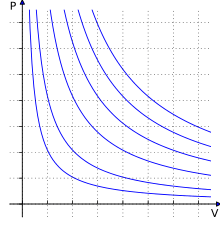 Isotherms of an ideal gas. The curved lines represent the relationship between pressure (on the vertical, y-axis) and volume (on the horizontal, x-axis) for an ideal gas at different temperatures: lines that are farther away from the origin (that is, lines that are nearer to the top right-hand corner of the diagram) represent higher temperatures. is the absolute temperature of the gas. It can also be derived microscopically from kinetic theory, as was achieved (apparently independently) by August Krönig in 1856 and Rudolf Clausius in 1857. The state of an amount of gas is determined by its pressure, volume, and temperature. The modern form of the equation relates these simply in two main forms. The temperature used in the equation of state is an absolute temperature: the appropriate SI unit is the kelvin. In SI units, P is measured in pascals, V is measured in cubic metres, n is measured in moles, and T in kelvins (the Kelvin scale is a shifted Celsius scale, where 0.00 K = −273.15 °C, the lowest possible temperature). R has the value 8.314 J/(K·mol) ≈ 2 cal/(K·mol), or 0.08206 L·atm/(mol·K). It is common, especially in engineering applications, to represent the specific gas constant by the symbol R. In such cases, the universal gas constant is usually given a different symbol such as to distinguish it. In any case, the context and/or units of the gas constant should make it clear as to whether the universal or specific gas constant is being referred to. where P is the absolute pressure of the gas, N is the number of molecules in the given volume V (the number density is given by the ratio n = N/V), kB is the Boltzmann constant relating temperature and energy, and T is the absolute temperature. The number density contrasts to the other formulation, which uses n, the number of moles and V, the volume. This relation implies that R = NAkB, where NA is Avogadro's constant, and the consistency of this result with experiment is a good check on the principles of statistical mechanics. In extreme conditions the principles of statistical mechanics may break down as some of the assumptions relating a real life example to an ideal gas become untrue. In SI units, P is measured in pascals, V in cubic metres, Y is a dimensionless number, and T in measured kelvins. kB has the value 1.38·10−23 J/K in SI units. The table below essentially simplifies the ideal gas equation for a particular processes, thus making this equation easier to solve using numerical methods. A thermodynamic process is defined as a system that moves from state 1 to state 2, where the state number is denoted by subscript. As shown in the first column of the table, basic thermodynamic processes are defined such that one of the gas properties (P, V, T, or S) is constant throughout the process. For a given thermodynamics process, in order to specify the extent of a particular process, one of the properties ratios (which are listed under the column labeled "known ratio") must be specified (either directly or indirectly). Also, the property for which the ratio is known must be distinct from the property held constant in the previous column (otherwise the ratio would be unity, and not enough information would be available to simplify the gas law equation). In the final three columns, the properties (P, V, or T) at state 2 can be calculated from the properties at state 1 using the equations listed. ^ a. In an isentropic process, system entropy (S) is constant. Under these conditions, P1 V1γ = P2 V2γ, where γ is defined as the heat capacity ratio, which is constant for a calorifically perfect gas. The value used for γ is typically 1.4 for diatomic gases like nitrogen (N2) and oxygen (O2), (and air, which is 99% diatomic). Also γ is typically 1.6 for monatomic gases like the noble gases helium (He), and argon (Ar). In internal combustion engines γ varies between 1.35 and 1.15, depending on constitution gases and temperature. The equation of state given here applies only to an ideal gas, or as an approximation to a real gas that behaves sufficiently like an ideal gas. There are in fact many different forms of the equation of state. Since the ideal gas law neglects both molecular size and intermolecular attractions, it is most accurate for monatomic gases at high temperatures and low pressures. The neglect of molecular size becomes less important for lower densities, i.e. for larger volumes at lower pressures, because the average distance between adjacent molecules becomes much larger than the molecular size. The relative importance of intermolecular attractions diminishes with increasing thermal kinetic energy, i.e., with increasing temperatures. More detailed equations of state, such as the van der Waals equation, account for deviations from ideality caused by molecular size and intermolecular forces. A residual property is defined as the difference between a real gas property and an ideal gas property, both considered at the same pressure, temperature, and composition. where C is a constant that is directly proportional to the amount of gas, n (Avogadro's law). The proportionality factor is the universal gas constant, R, i.e. C = nR. The ideal gas law can also be derived from first principles using the kinetic theory of gases, in which several simplifying assumptions are made, chief among which are that the molecules, or atoms, of the gas are point masses, possessing mass but no significant volume, and undergo only elastic collisions with each other and the sides of the container in which both linear momentum and kinetic energy are conserved. where dV is an infinitesimal volume within the container and V is the total volume of the container. where n = N/NA is the number of moles of gas and R = NAkB is the gas constant. ↑ Clapeyron, E (1834). "Mémoire sur la puissance motrice de la chaleur". Journal de l'École Polytechnique (in French). XIV: 153–90. Facsimile at the Bibliothèque nationale de France (pp. 153–90). ↑ Krönig, A. (1856). "Grundzüge einer Theorie der Gase". Annalen der Physik und Chemie (in German). 99 (10): 315–22. Bibcode:1856AnP...175..315K. doi:10.1002/andp.18561751008. Facsimile at the Bibliothèque nationale de France (pp. 315–22). ↑ Clausius, R. (1857). "Ueber die Art der Bewegung, welche wir Wärme nennen". Annalen der Physik und Chemie (in German). 176 (3): 353–79. Bibcode:1857AnP...176..353C. doi:10.1002/andp.18571760302. Facsimile at the Bibliothèque nationale de France (pp. 353–79). ↑ Moran and Shapiro, Fundamentals of Engineering Thermodynamics, Wiley, 4th Ed, 2000. Configuration integral (statistical mechanics) where an alternative statistical mechanics derivation of the ideal-gas law, using the relationship between the Helmholtz free energy and the partition function, but without using the equipartition theorem, is provided. Vu-Quoc, L., Configuration integral (statistical mechanics), 2008. this wiki site is down; see this article in the web archive on 2012 April 28.